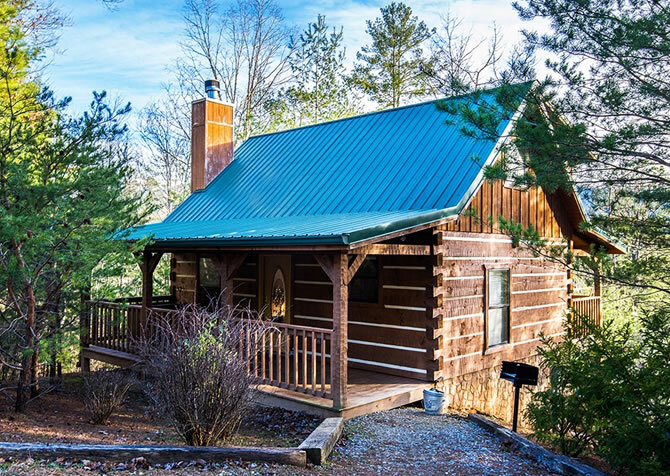 Little Smoky Secret, a charming 1-bedroom cabin just a few miles from Foxfire Mountain Adventures, is the ideal Pigeon Forge retreat for a honeymoon, anniversary, or vacation for a small family. 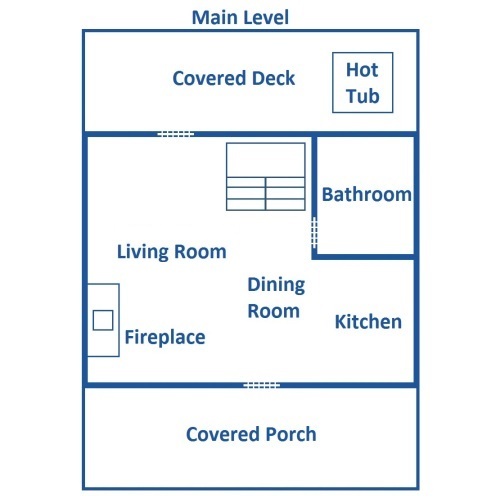 It has all the classic cabin features – beautiful wood walls, log furniture, mountain views from the deck, and an inviting fireplace – along with comfortable spaces to relax and rest. Arrivals will be easy with a flat driveway, parking for up two vehicles, and just a few steps up into the cabin, so you’ll start your vacation off on the right foot. When you step inside, you’ll be greeted by a homey atmosphere and all the amenities you’ll need for a memorable stay in the Great Smoky Mountains! Feel at home in this cozy living room, complete with comfy sofa, log coffee table, fireplace, recliner, reading lamp, and TV. Prop up your feet and stay cool while watching TV on lazy afternoons, or curl up by the fire on a cool Smoky Mountain evening and listen to music on the CD player. If you’re here as a couple, it will be a relaxing and romantic place to unwind. For families, it’s a nice open space where kids can play and parents can hang out and rest. If you need some fresh air, take a step out onto the deck through the glass door here. Or you can just stay inside and enjoy the views through the windows on nice sunny days. For a fun night in the cabin, bring a board game or a few decks of cards and have a family game night gathered around the coffee table by the fire! Charming and equipped with all you need to make meals or snacks at the cabin, the kitchen of Little Smoky Secret is a great amenity that you won’t find in most hotel rooms. 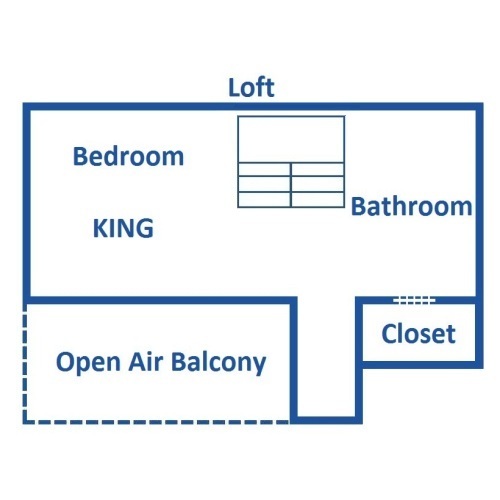 The open space features a dishwasher, oven/stove, microwave, and refrigerator, along with a coffeemaker and enough dishes, glasses, and utensils for four. You’ll have a place to store leftovers after a meal downtown, or you can enjoy a romantic dinner for two at the kitchen table. 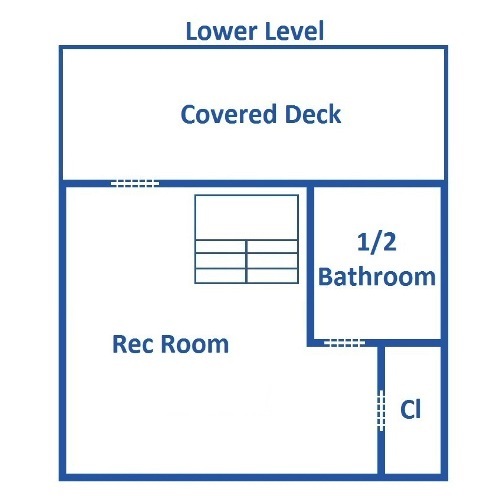 The rec room of Little Smoky Secret boasts light wood walls, a soft carpet underfoot, and games to keep you entertained for hours. Kids and adults of all ages will love hanging out and playing here! You can play a few rounds on the pool table or play some air hockey in this comfortable room. During summer, it will be a nice, cool place to hang out and take a break from the summer heat. In winter, you can stay warm inside while playing games or curling up on the comfy couch that features a charming mountain motif. What a great space to relax on a fun family vacation! If you're looking for more fun, check out the nearby Foxfire Mountain Adventures where you can take a zip line tour, go on America's longest swinging bridge, or explore the great outdoors on an ATV! The bedroom of Little Smoky Secret is a relaxing oasis for couples. The all-wood room is warm and inviting with large windows that allow you to wake up to the beautiful mountain sunlight or watch the snow fall during winter. The room is furnished with comfort in mind, with a beautiful king-size log bed that has a quilt draped over it. There is even a comfy rug by the bed, so you'll have a soft place to rest your feet before crawling out of bed. Log nightstands on either side of the bed have reading lamps for when you want to curl up with a book before drifting off to sleep. The bedroom has its own bathroom for your convenience, and there is even a jetted tub where you can take a soothing bath. If you want to make it extra special, add one of our luxurious gift baskets, which are filled with bath salts, soaps, and more. There is even a window above the jetted tub, so you can watch the stars as you soak at night. 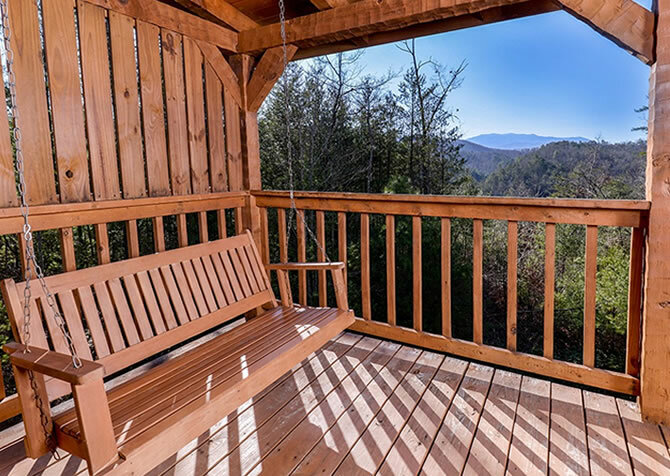 Little Smoky Secret has some wonderful outdoor spaces – perfect for enjoying the sights, sounds, and smells of the Great Smoky Mountains. 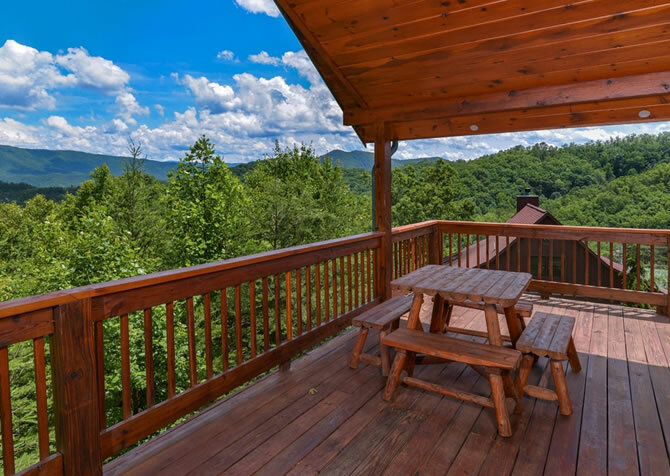 Out on the deck, an outdoor hot tub is the place to unwind after a long day of hiking in the Great Smoky Mountains National Park or exploring the attractions, shops, and restaurants of downtown Pigeon Forge. There is also a privacy screen by the hot tub, so couples can enjoy some romantic time together. 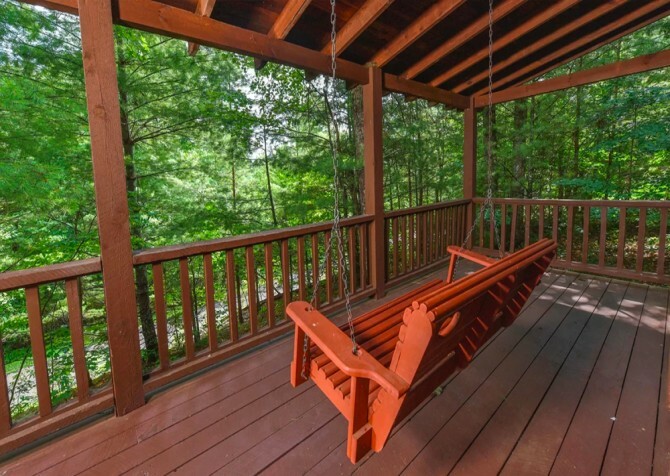 On nice days, head out onto the deck to relax in the porch swing. As you sit, you'll enjoy the beautiful views of the mountains in the distance. There are also rocking chairs and a charcoal grill, so you can cook steaks, burgers, and more on a sunny mountain day. Bring your favorite music to listen to on the CD player, or bring your favorite movies to watch on the DVD player and VCR. You can fall asleep watching TV in bed, or you can just enjoy the relaxing atmosphere of your own cozy cabin. At Little Smoky Secret, you'll also have easy arrivals with a flat driveway. From games to cozy furnishings, this charming one-bedroom cabin has all you need for a relaxing and fun getaway in Pigeon Forge! Spend a day of fun at this exciting theme park that features carnival games, unique shops, Southern food, shows, roller coasters, and more! Speed around the go kart track for an afternoon of excitement in Pigeon Forge! Kids and adults will love hopping behind the wheel and racing around the tallest wooden track in the area! Tour these incredible caverns to find sparkling cave formations and a crystal clear stream, both highlighted by great tour guides and special effects! "This cabin is beautiful! My husband and I visited this weekend for 1 year anniversary and this cabin is perfect for a couple wanting to get away from the city and just be together. The views are breathtaking and the cabin had everything we needed.…"
"This cabin is beautiful! My husband and I visited this weekend for 1 year anniversary and this cabin is perfect for a couple wanting to get away from the city and just be together. The views are breathtaking and the cabin had everything we needed. My first cabin experience and it was awesome." We are so happy to hear you had a wonderful time with your husband and want to thank you for this wonderful review! "This cabin is great for a getaway weekend. Although it's location is in a very bad spot. It is 20-25 mins from downtown Pigeon Forge. It is a very romantic cabin for a new married couple or a retired couple wanting to get away from people." Thank you for taking the time to leave us a review. We are glad to hear that this cabin was great for you. Thank you for sharing your feedback and we hope to serve YOU again soon.